Don't Write. 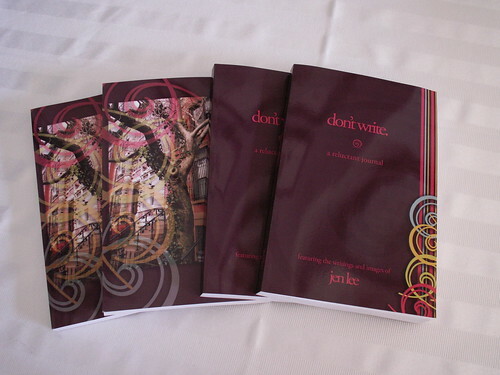 A Reluctant Journal, originally uploaded by jenleedotnet. I wish I could go into the challenges of the last week in gory detail so you would know the miracle it is that the pre-ordered journals shipped this morning. I believe that communities can generate miracles, and mine has been no exception. Without the generosity of Denise and Maggie, the eager help of my husband, Christina, Dennis the postal carrier and Priscilla, or the gentle and kind words from my friends and family, I would not have pulled it off given the difficulties we've faced. This morning I sat with a new friend and I told her the story of this journal and what it means to me as we flipped through the pages and admired the finished product. It was the first time I've slowed down enough to really celebrate the fulfillment of this dream. This limited-edition, first-run printing gave us a sample of this work, as well as a taste of the response it would generate out in the world. Its journey is just beginning, but still I am so moved by the thought of this journal in the hands of people in Indonesia, New Zealand, France, the UK, all across North America and even in the hands of my neighbor, who said she was inspired to start writing. I almost crumbled. Thank you to all of you who sent words of encouragement and support and prayers my way in these last days. I am dreaming of the happy trips to the mailbox that are coming soon. Joy is all around. **Orders received by last night shipped this morning. The next shipment will go out next week. Thank you! Who's a Public Figure Now?